At Schmitt Law Firm, as motorcycle riders, we know the importance of hiring a qualified motorcycle wreck attorney. After an accident, getting back to good health must come first. Hiring a motorcycle wreck attorney to get you help to pay for medical bills and replacement of your bike must also be a priority. We also want to help you avoid another accident with the safety tips in this article. The lights are easy to install and come in a wide of sizes and colors. Also, follow general safety rules that mainly rely on common sense. Always turn on the headlights when you cannot see other drivers ahead and assume that they can’t see you either. Part of being visible as a motorcyclist is not sneaking up on drivers. Motorcyclists make the fatal mistake of riding too close to cars or riding along their blind spots. Give the car at least 5 or more feet of space in between your vehicle. A driver could make the sudden move of switching lanes without signaling and cause an accident within seconds. 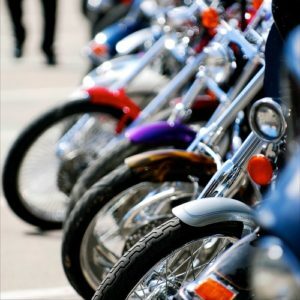 Another common cause of motorcycle accidents is the squeeze in that bikers do to get ahead of traffic. On crowded roads, they assume that their motorcycles can fit in between the narrow spaces between cars. Sometimes, they drive along the narrow shoulders of the road. In every situation, they have to speed up to move ahead of regular traffic. It’s easy for motorcyclists to make the wrong calculations when they perform this maneuver. They think that the space is larger than it is. As a result, they may clip the side mirror of a car or be too close and scratch along the sides. In the worst cases, they speed up and crash into a car – sometimes for going too fast. Motorcycles are popular for their high speeds, but sometimes they go too fast to be safe. When driving too fast, it’s easy to become reckless and make unsafe moves. It is much better to maintain speeds that are within recommended speed limits. Motorcycle crashes are more common than you’d expect and they are the deadliest. In every dangerous driving situation, the motorcyclist is more likely to crash violently than the car driver. In some cases, the motorcyclist is at fault, but in others, they are not and become victims. Receive the damages that you deserve by hiring the right motorcycle wreck attorney to represent you in court.